Disney returns with another one of its classic animated films put to a Blu-ray Signature Collection edition, and this time it's Pinocchio. Like the other releases, it comes with all the bells and whistles; in addition to a bunch of bonus features, you also get a DVD version and a digital HD version so you can watch this thing pretty much anywhere you have a screen. The transfer to HD looks fantastic, looking crisp and clean like it could have been made today and not 77 years ago. 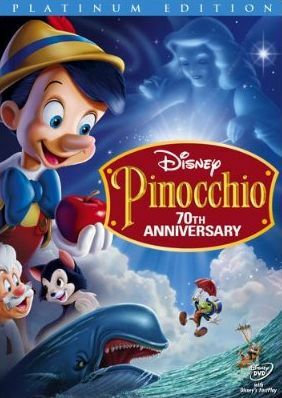 It's been at least seven or eight years since I've seen Pinocchio and it's not one of favorite Disney films so I was surprised by how much I had forgotten about it, like how his knows only grows once in the whole movie. On Pinocchio's first day of school, he never arrives. Amber alert! Amber alert! C'mon, I know Geppetto is old but you'd think he'd walk his new wooden son to school on his first day. Anyway, he's fast-talked by Red Fox into going into showbiz (aka working for an evil puppeteer). All seems good at first until the puppeteer locks Pinocchio in a cage and drives away. Meany! But Jiminy arrives to save the day! Unfortunately, he can't... wow, big help he is. So the Blue Fairy appears and helps them out. So now everything's good, right? The Pinocchio Project: "When You Wish Upon A Star" - Today's hottest music influencers create their own version of the iconic song. Walt's Story Meetings: Pleasure Island - Recently discovered original artwork reveals a Pleasure Island that never made it to the big screen. In Walt's Words: Pinocchio - Through recordings of rare interviews, Walt discusses the magical making of his legendary classic. Song Selection - Karaoke-like feature. Other Disney release have this too but I never use it. That is a ton of extras! Thought to be fair not all of them are worth watching. But still, there's enough to make it worth the money, assuming you like the movie.